All four casters swivel and enable you to roll the server in every direction. While these four swiveling castors help position the server at the installation site, the server can roll off course if you do not follow the guidelines in Move the Server to the Installation Site. When moving the server, position a person at each corner of server in order to maneuver it carefully around corners and obstacles. 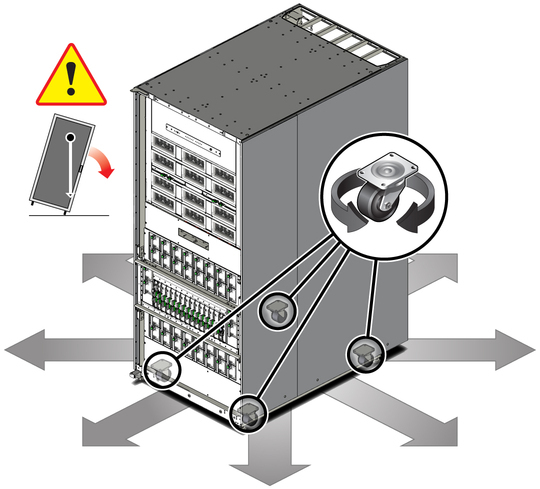 Caution - Avoid rolling the server over metal plates that contain tear drop or diamond patterns. These patterns can cause the castors to spin and force the server to move off course.